Regardless whether you took the Overpass or PBF route, you now have an OSM file with named nodes. How you can get place / city boundaries will depend on where you are. In some areas, OSM itself may be a great source, check Wambacher’s boundaries site. In the U.S., official place boundaries are easily available from Census, which is where I got them. To do the needed spatial operations, you could use QGIS, but I like PostGIS. So I load the OSM and place data into a spatial datbase. Okay, data ready. Now for the processing. I use a meter-based projection appropriate for the area so I can get the area size in km^2, but strictly that is not necessary because we’re looking for relative results. For good measure, I loaded both tables into QGIS, split the density values into quantiles, and used those buckets for visualization of the results, see above. 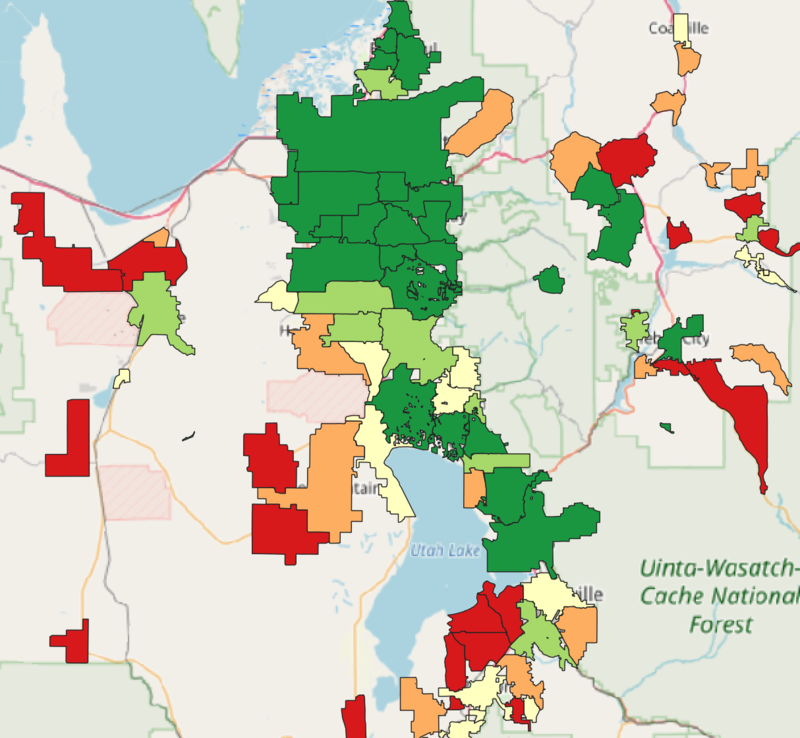 As expected, the cities and towns on the Wasatch Front, where we have a fair number of active mappers, score well in mappedness, whereas smaller towns in rural areas generally score poorly. My QGIS project file is here. In a follow up post, I will go into how the result could be improved. I would appreciate your feedback as input for that post. Nice. “Just use things with a name” is a good rule of thumb. I’d wonder about PoIs mapped as ways, which can often be a sign of more detailed mapped (replacing a shop mapped as a point with an area), but then you have to filter out roads. For km² calculations I like PostGIS’s geography type. ST_Area(t.geom::geography) gets you m² areas on a sphere. Thanks for the tip re the geography type cast, that is clever. POIs mapped as ways would be good to include, but would make things a little more complicated. Fortunately you don’t need the actual way geometries which reduces osmosis load time in PG. You would need to filter by closed ways only, I don’t know if osmium lets you do this? Straight density doesn’t strike me as being an effective measure of “mappedness”: in a perfectly-mapped area, it should closely reflect population density. Estimating the expected number of POIs should give a more accurate measure. For example, the ratio of the number of POIs to the length of roads, or the ratio of POI density to the above-mentioned population density.